Written by Dominik Joe Pantůček on January 24, 2019. While creating Cryptoucan™, I had the opportunity to also practice my other skills. Today, I would like to briefly explain how the music for the videos was made and how the infamous Pretty Good Privacy a.k.a. Cryptoucan™ song was made. 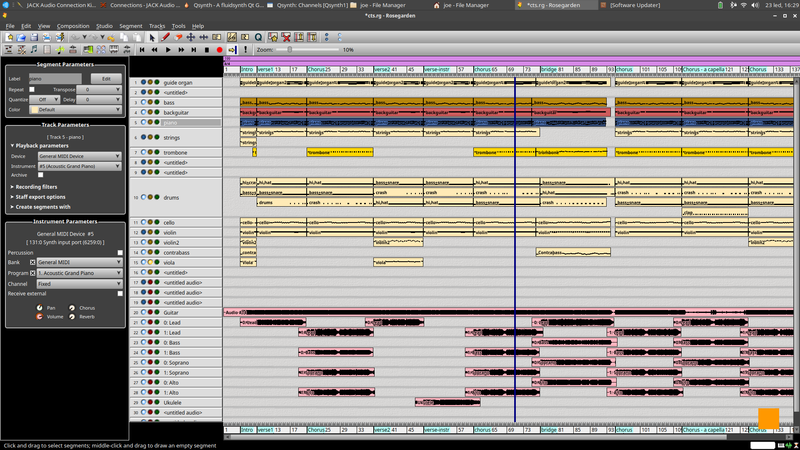 Read on to learn something about music production on GNU/Linux! Everyone remembers the success the Cryptoucan™ song – as seen in Video 1 below – was at LinuxDays conference. More and more people are asking, how are we – or more specifically, how am I – producing such music. Other companies hire external marketing specialists for such tasks… But that is not the case here at Trustica. We are producing the music using GNU/Linux with Jack Audio Connection Kit as the digital audio workstation core with FluidSynth/QSynth for the MIDI instrumentations, Audacity for audio editing and Rosegarden for composing and mixing everything together. When it comes to hardware, you might be surprised how all this can be done using pretty common computer with consumer “i7-5600U CPU @ 2.60GHz” CPU, sub-10€ USB audio card, simple 4-line mixer bought in 2001 and small MIDI keyboard. Picture 1: Rosegarden project with Pretty Good Privacy / Cryptoucan™ song. As you can see in Picture 1, the whole composition is rather simple and fits on one computer screen. And as it has been almost three years since I bought the Oxygen 61, this week it was time to upgrade to Keystation 88 and I must admit, it makes the work flow much smoother. Hope you enjoyed a small peek under the hood of our production process and stay tuned for more next week! We can also promise you (finally) more usage videos here.